Houston TX Necklift Surgery, Cervicoplasty | Memorial City | Sanaz Harirchian, M.D. Dr. Harirchian’s practice is dedicated to aesthetic and reconstructive surgery of the face. She focuses exclusively on the face and neck. 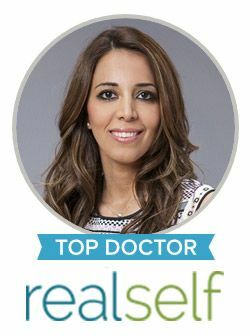 She combines her artistic eye, perfectionist style, and thorough understanding of the science behind the aging process with cutting-edge, advanced face & neck procedures. By focusing only on the face and neck, Dr. Harirchian believes that she can give her patients the best care and outcomes. She can perform different types of facelifts and necklifts, and will tailor her technique to best treat your face. With age, the muscle, connective tissue, and fat pads of the face and neck descend. In the neck, this can lead to a poorly defined neckline, fullness underneath the chin in the submental area, and neck “banding.” The muscles and connective tissue of the cheek and midface make up the superficial muscular aponeurotic system (SMAS), which lies deep to the skin. The SMAS continues into the neck as the platysma muscle. The “deep plane” of the face is made up of the SMAS and platysma muscle. The platysma muscle is a broad sheet of superficial muscle which courses the entire neck and extends into the cheek. The platysma muscle is separated by a small gap in the submental area. With age, the platysma muscle can lose tone and descend. In addition, changes occur in the composition of the skin and connective tissue. The skin loses collagen and elastin, reducing the skin’s strength. When the skin becomes less elastic, it can descend with gravity. The combination of changes in the skin, connective tissue, and muscle result in a sagging neck. Neck lift surgery can rejuvenate the neck by repositioning and lifting the descended tissue, creating a smooth straight neckline. Dr. Harirchian uses a deep plane approach to rejuvenating the neck. This means that she dissects underneath the “deep plane” muscle of the neck, to move muscle and connective tissue layers back to a more natural and youthful position. After the deep structures are tightened and lifted, the excess skin is removed. The goal of Dr Harirchian’s neck lift approach is to restore the youthful anatomy of the neck by lifting and repositioning the deeper tissues. The focus is not on pulling or lifting skin only. Consequently, patients look natural and youthful. A necklift addresses the neck by improving sagging in the neck, fullness in the submental area, and neck banding. A necklift will sculpt and remove the fat in the neck, tighten the platysma muscle, and remove excess neck skin. A full facelift addresses both the face and neck by improving aging and sagging in the cheeks, midface, jowls, and neck. A neck lift is best for younger patients with aging changes in the neck, without significant aging changes in the face or jowls. A necklift involves an incision made underneath the chin, whereby excess neck fat is carefully and conservatively sculpted and removed. A corset platysmaplasty is then performed to tighten the platysma neck muscle. An incision is then made behind the ear in the hairline. Dr. Harirchian dissects underneath the platysma muscle of the neck from the sides, to move muscle and connective tissue layers back to a more natural and youthful position. Excess skin is removed after the deep tissue is tightened and lifted. A necklift has limited results in older patients with significant sagging of the neck and/or jowls. These patients benefit best from a full face lift. Contact our office today to schedule your consultation regarding necklift surgery with Dr. Harirchian.